What Are My Non-Surgical Options for Heel Pain? Most people will try just about anything if they think it will keep them out of surgery. Well, we have good news for you: we’re the same way! Well, maybe we wouldn’t try “just about anything.” We do have standards! But what we’re trying to say is that, from a medical point of view, we see surgery as a last resort only—especially for inflammatory conditions like heel pain. That’s not to say surgery is always a bad thing. For some conditions—severe bunions, for example—surgery may genuinely be your best (or only realistic) option. And surgery can be effective in many cases! But because surgery comes with some headaches (pain, down time, possible complications) we try to avoid it if we can. Take heel pain, once again. We’ve spent a lot of time, effort, and money to bring some of the most advanced conservative therapies for heel pain to our Las Vegas office. We’ve done the research, kept up with the latest studies, and incorporated the best scientifically tested and approved methods into our treatment approaches. Those high-tech solutions won’t always be necessary in every case, but they’re there if you need them—so that you have the best possible odds for a successful resolution to your heel pain, without surgery. Can I Treat My Heel Pain at Home? Minor heel pain cases can often be successfully managed and treated at home, on your own. But for this to work, you should begin your home care as soon as possible after you observe painful symptoms. The longer you ignore the pain, the more likely it will become chronic and impossible to manage on your own! The very first thing to do is to give yourself a break. Try to stay off your feet as much as possible. If your heel pain seems to be connected to a particular sport or activity—running, dancing, basketball, etc.—discontinue them for a while so your heels can rest and repair themselves. You might also consider pampering yourself a bit. Enjoy a nice foot soak. Give yourself a foot massage (or find someone else willing to do it for you). What If Home Care Doesn’t Work? While we hope that you’re able to resolve your heel pain quickly and with minimal fuss, we do recommend you come and see us if it isn’t working. Heel pain lingers for a week or more with little to no improvement, despite your home care efforts. Don’t keep waiting around for it to get better if it’s taking this long. Heel pain becomes so severe that it interferes with daily activities. This level of pain should be seen immediately, no matter how long you’ve had symptoms. We’ll get you in, find you a comfy seat, and go through our initial evaluation. There are many possible causes of heel pain. Plantar fasciitis is the most common, but far from the only one. It could be tendinitis. It could be a pinched nerve. It could be arthritis, stress fractures, or even a bad bruise. So, before we create a custom-tailored treatment plan for you, we need to know precisely what’s causing it and how serious it is. We’ll ask you about your symptoms and your activities, and run any other diagnostic tests we need to (X-rays, for example) to confirm a diagnosis. Once we have that diagnosis, we can start piecing together an overall treatment strategy customized to your specific needs. We have a lot to offer at our practice—not just the tried-and-true basic care options that doctors have been using for decades, but also much more sophisticated techniques and innovations. Wearing over-the-counter arch supports or insoles. Custom orthotics. Like regular arch supports, but specially made from a cast of your foot to ensure a perfect fit. These are a great option particularly if your heel pain arises from a structural imbalance or foot deformity, such as flat feet. Extracorporeal pulse activation treatment. This is a non-invasive procedure that triggers accelerated healing mechanisms during a handful of brief sessions spaced out over a few weeks. EPAT is perfect for severe heel pain that hasn’t responded to other treatments, and it’s also ideal for athletes and workers who absolutely need to be back on their feet as quickly as possible. Combination Electroanalgesia Therapy. This advanced treatment for peripheral neuropathy can be effective for cases of heel pain caused by nerve damage. 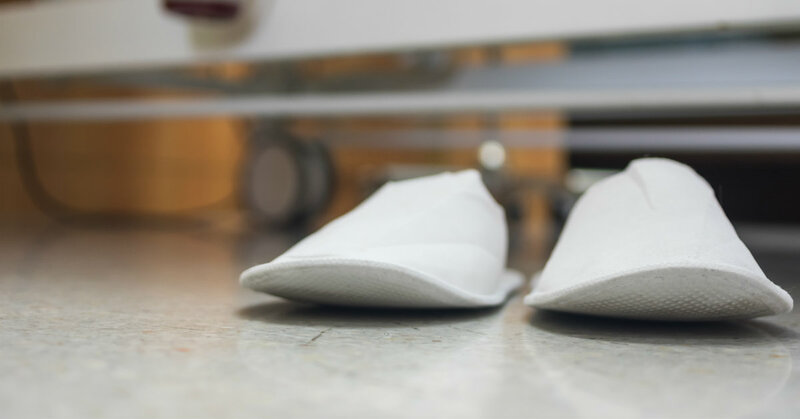 If it’s possible to treat your heel pain without surgery, no one in Las Vegas is better equipped to do it than our team here at Absolute Foot Care Specialists and the Heel Pain Center of Nevada. If you’re finally ready to overcome that pain and get back to doing what you love, give us a call today at (702) 839-2010.